I’ve recently bought my very first own surfboard. Choosing the right one isn’t easy, especially when you’re new to the surfing world. As in the case of buying a wetsuit the easiest way is to go to a surf shop near by. But when you don’t have one in your neighborhood it’s starting to be complicated. And that’s my case. Thanks to the Internet there are ways to manage this. Here’s mine. I started thinking about buying my own board about a year after my first surf session. At this point I knew a bit about the sport itself and equipment. Still, I began my research with getting more specific information about surfboards specification. Here’s the list of articles that helped me understand those basics. PU or Epoxy: Which one is best? Knowing what types of boards are there the next step is to calculate the right volume and dimensions for your board. I found three online tools to do that. 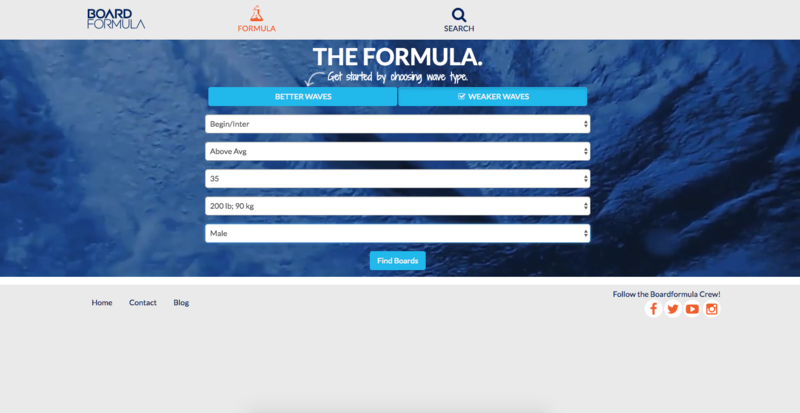 BoardFormula is a volume calculator that generates your individual minimum and maximum suggested volume based on such information as wave quality, skill level, fitness condition, age, weight and body type (male/female). The lower volume indicates the minimum flotation for a performance shortboard. The larger number shows the suggested volume for an everyday or groveler model. After filling the form with your options the calculator displays a list of suggested boards. In the right upper corner it displays the suggested volume. 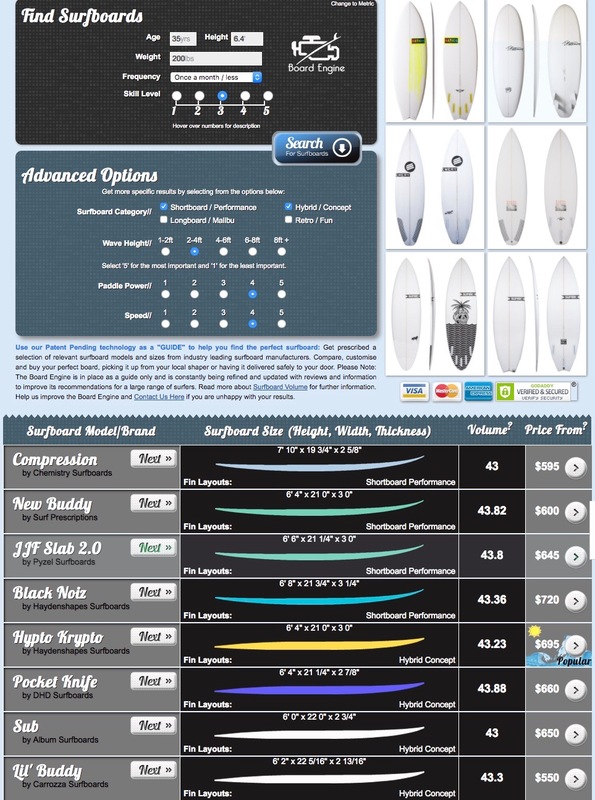 The algorithm allows to compare selected surfboards on two levels: visual and technical. I personally really like this feature. It’s simple yet visually attractive. What I’m missing in this calculator is an explanation of the criteria set out in it. 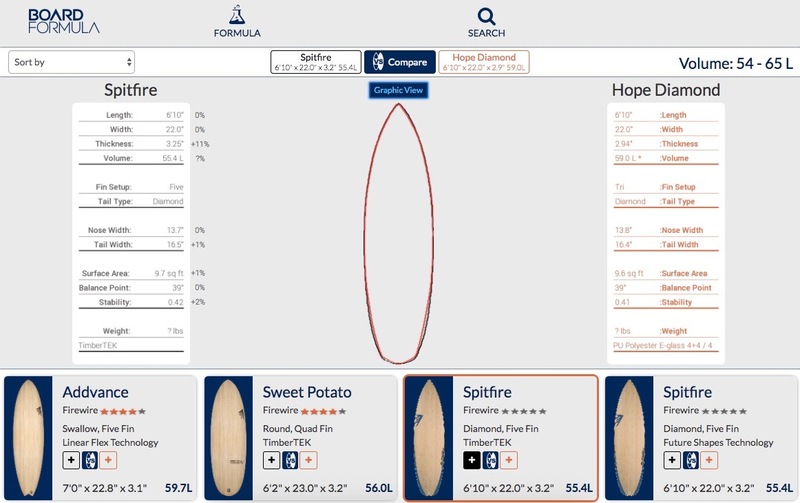 More precision in this area brings the „Board Engine” prepared by Boardcave. 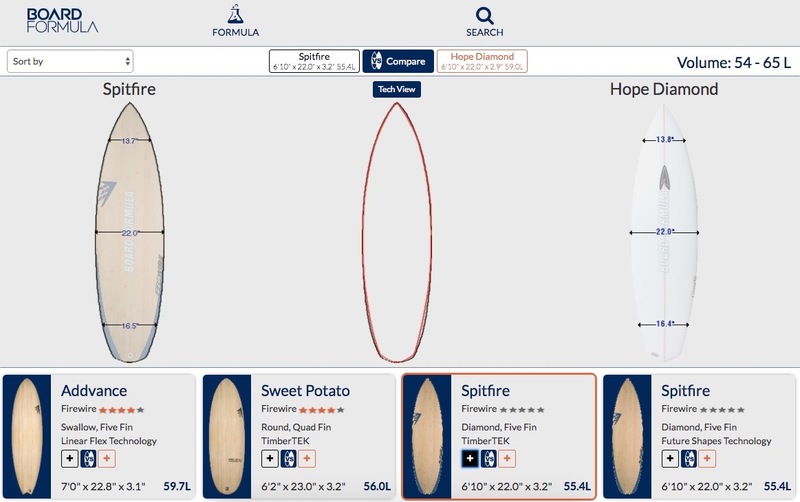 A site developed by two Australians (surfers who worked in technology industry) helps to find, compare and buy surfboards and surf hardware from the world’s leading surf brands like DHD, Pyzel, Chemistry, Haydenshapes, Futures, FCS fins and much more. What I like about it is that the form has more options then in BoardFormula engine and every criteria is clearly explained (as seen on the screens below). It gives a sense that the outcome will be more accurate. After collecting and analyzing data from those three sources I was ready for the next step. At this point the right volume and dimensions of a dream board are known. It’s time to decide what brand and specific model it will be. BoardFormula and Boardcave provide a list of recommended boards. I personally recommend to narrow this list and focus on 3-4 models. The reason is easy: less is more. 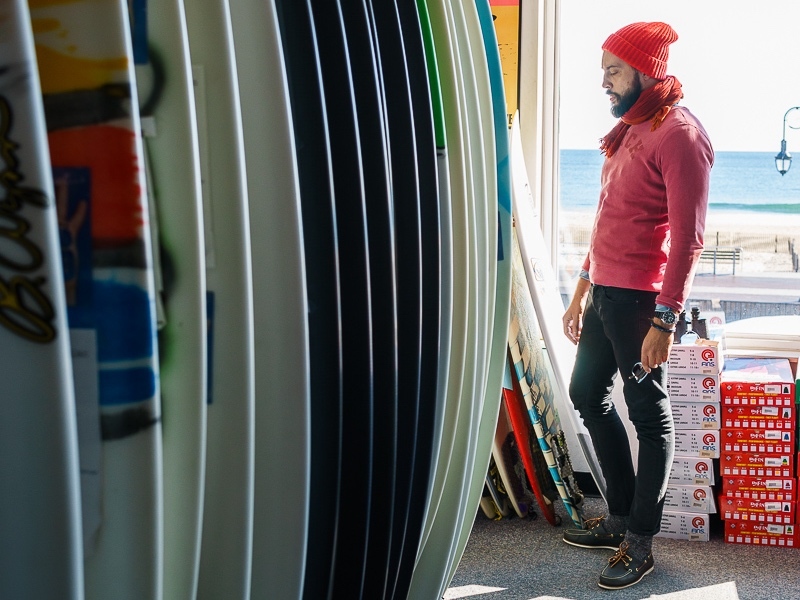 With less boards on my mind when deciding about the purchase I’m more focused and better prepared for actions that need to be taken in step 5. This decision is influenced by several factors like budget, skill level and availability of preferred models online. In my opinion, if you have money for a new board and you live near the beach it is worth to invest in new equipment. When surfing often you probably won’t have the feeling of spending a lot of money on the surfboardboard, which mostly lays somewhere in your garage and is used several times a year during surfing trips. In other cases it’s better to start with a used board. 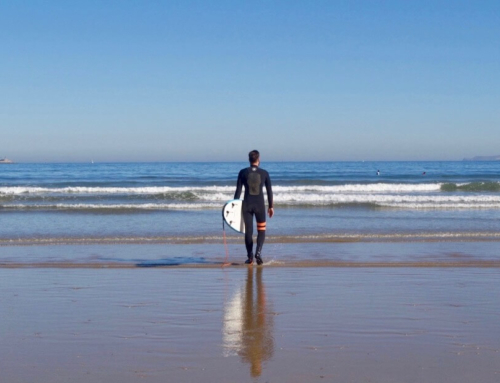 Second hand equipment is also more reasonable choice for people who are getting started with surfing or changing the board because of reaching a new level of their skills in the art of riding waves. Another very important factor in making the decision “new or used” is the availability of used boards on the Internet. In my experience it is very difficult to find equipment that is ideally suited to the parameters that has been defined in the second step. 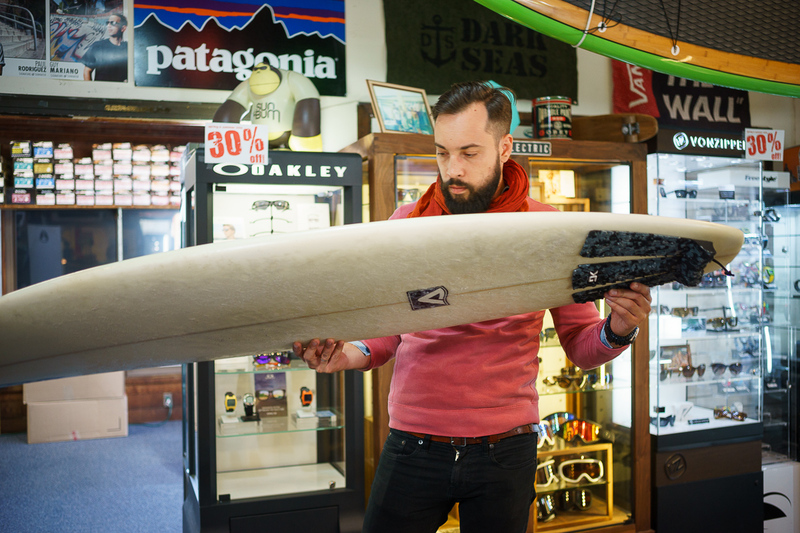 When buying a used board online, you must consider compromise or adjust to a longer process of finding the one. Of course even in countries where surfing is difficult to practice (Poland, Sweden) there are places on the Internet where you can eventually find interesting offers of used boards. 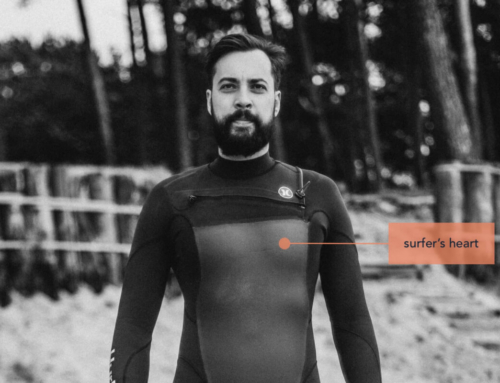 In countries where surfing is more popular there are online tools that aggregate second hand boards from surf shops or surfers. I personally explored the US market and the site that most appealed to me was Boardgrab. Sites like Boardgrab are great. You can buy a board without stepping out of your house. But they also have one disadvantage that is obvious and visible at a glance: you can’t touch the surfboards. And to precisely examine and feel a board is very important when buying a used one. In that case it is worth to use so called ROPO model of purchase which worked for me. ROPO means „research online purchase offline”. 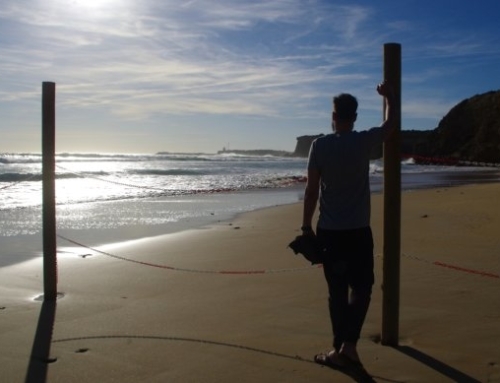 I also think that if you’re not an experienced surfer who knows exactly what he wants and has 700 USD to spend on a board it’s safer to close the computer and go out there (with your parameters and shortlist of boards in your smartphone of course). 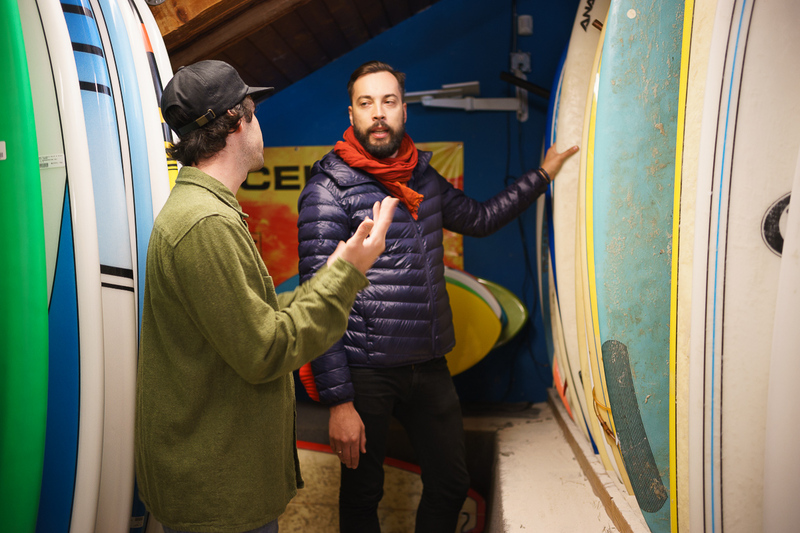 Maybe you’ll get to hear the unique story of your chosen board from a person who rode it or maybe some surf shop owner will help you make a better decision. Lastly, you’ll probably have a chance to test the board in the water.